Happy New Year! I'm back from my "recovering from laser eye surgery" hiatus (more on that later)... is it too early to start talking about spring collections? 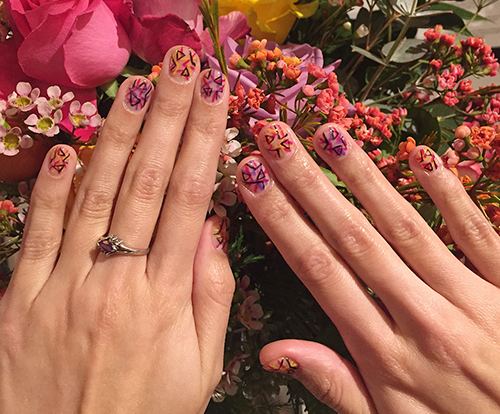 Back in December, I was invited to preview the CND Spring 2017 New Wave Collection at Onyx Aesthetics Studio in Gastown and, based on the amazing mani I received last year, I knew I'd come away with some fun and intricate nail art that just had to be shared. The first thing I thought when I saw the bright colours of the New Wave Collection was that I wanted to do something a little crazy. My inspiration was the 80s so I asked my nail technician to create a colourful "print" topped with black geometric triangular shapes. As you can see, she delivered my vision perfectly! 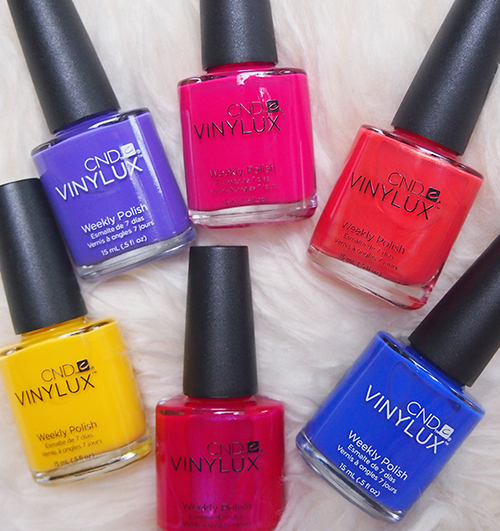 While I got a Shellac manicure, the New Wave Collection is also available in VINYLUX, CND's long-wearing polish (it lasts a week with no chips). It features 6 shades: Video Violet, Pink Leggings, Jelly Bracelet, Blue Eyeshadow, Ecstasy, and Banana Clips [clockwise from top left]. Definitely not for neutral nail lovers as they are all super bright and quite neon, but I'm thinking these will be super fun for manis and pedis once the weather warms up. such gorgeous nails! loving the design! Cant wait to see your success in 2017! wow love the nails! xO!